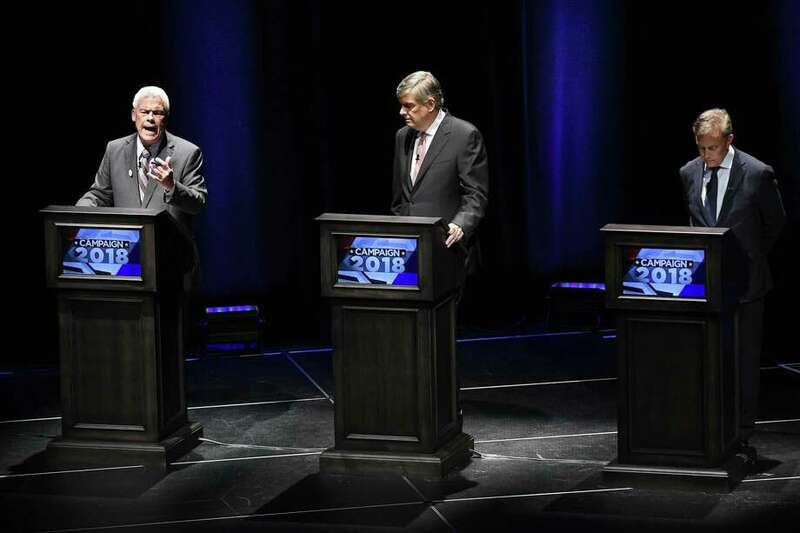 Independent candidate Oz Griebel, left, spoke, while Republican candidate Bob Stefanowski, center, and Democratic candidate Ned Lamont, right, listened during a recent debate in the governor’s race. Sacred Heart University on Wednesday night will host a discussion of the race. It will begin at 7 in the Martine Forum, 5401 Park Avenue in Fairfield, and is free and open to the public. FAIRFIELD - Sacred Heart University on Wednesday night will host a post-election analysis of the statewide election, featuring a panel that includes a pollster, a professor and two reporters. The event, which will begin at 7 p.m. will be held in the university’s Martine Forum, at 5401 Park Avenue. “What Happened and What Lies in Store for Connecticut,” is free and open to the public. The discussion will be moderated by Lesley DeNardis, director of the university’s Institute for Public Policy and director of the Master of Public Administration program. The event is sponsored by the Institute for Public Policy, the Hearst Connecticut Media Group, WSHU Public Radio and GreatBlue Research, which ran statewide polling for Sacred Heart University and Hearst.